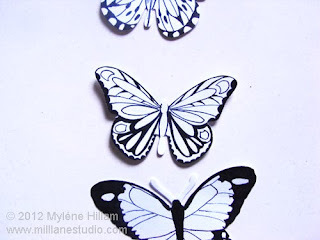 What do you do when you're staying in a motel room without access to your craft supplies? 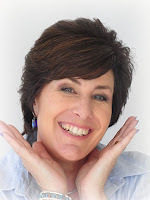 Sitting around with idle hands drives me crazy (just ask my DH!). So on a recent visit to Canberra, the only crafting supplies I could take were pen and paper. 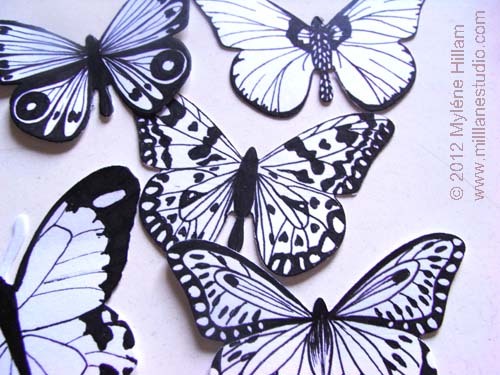 Keeping in mind the butterfly projects I've been creating lately, I die cut several butterflies and packed them into a ziplock bag with a fine black marker. Whenever I got a few spare minutes I whipped them out and started drawing. Here's a peek at what I've been working on. 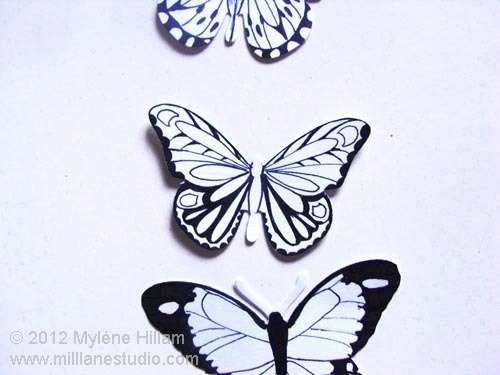 I haven't forgotten about the final shadow box in my black and white butterfly series - it's still on the drawing board. But perhaps some of these will make it into the last one. Thanks Pauline. It's quite a challenge to create identical wings but at the same time it's quite therapeutic.